Himalayan Crystal Salt Lamp: Aloha Bay, Ancient Secrets! Aloha Bay Salt Crystal Lamps are made from salt crystal rocks formed by nature hundreds of millions of years ago and mined over 500 yards underground from the foothills of the Himalayas. Lamps are carefully crafted by hand to retain the unique, beautiful and natural shape of the rock. The result is a rare crystal with such beautiful colors ranging from off-white to apricot and warm pink. BENEFITS: Salt crystal lamps promote comfort, relaxation and a healthy environment. Himalayan Rock Salt Crystals act as air purifiers by neutralizing harmful pollutants and emitting health promoting ions through a process only possible with the mineral salt. As the lit bulb or a tea light warms up the lamp, healthful negative ions. These ions clean the air by removing dust, pollen, dander, and cigarette smoke. They also offset the harmful radiation produced by computer monitors, TVs and other electrical devices. USES: Home: Helps your well-being and help purify the surrounding air, especially those with allergies and asthma. Work/Office: Helps stimulate the senses thus helping to improve focus and concentration while minimizing the effects of fatigue, stress, artificial lighting, forced air heating systems, and the radiation from office equipment and computer terminals. Children's Room: Can enhance your child's sleep as it keeps the atmosphere calm and soothing. Massage Room: Helps promote a deep state of relaxation, allowing each session to be much more effective. Waiting Rooms: Helps create a soothing atmosphere. A salt crystal lamp glowing in a consulting or treating room assists the healing process and adds to a caring, supportive environment. Smoky Areas: Helps clear away those lingering cigarette smoke/smells faster.Color Therapy/ Chromotherapy: Their soothing light helps people suffering from insomnia. • Himalayan Crystal Salt Lamp Large: Weight: 15-20 lbs., height: 10-12". Hardwood Base and includes 110 V light fixture, switch and bulb. ORDER TODAY! • Himalayan Crystal Salt Lamp Medium: Weight: 9-12 lbs., height: 8-9 inch. Hardwood Base and includes 110 V light fixture, switch and bulb. ORDER TODAY! • Himalayan Crystal Salt Lamp Small: Weight 5-6 lbs., Height 7-8", Diameter 5 inch. Hardwood Base and includes 110 V light fixture, switch and bulb. ORDER TODAY! diameter 4 inch. Includes a Palm Wax™ Tea Light candle. ORDER TODAY! 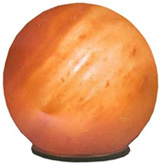 • Himalayan Crystal Salt Lamp Planet Globe: Weight: 6-7 lbs., globe: 6inch. High end decorative item. Hardwood Base and includes 110 V light fixture, switch and bulb. ORDER TODAY! 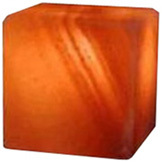 • Himalayan Crystal Salt Lamp Cube: 4 inch. High end decorative item. Includes bulb. ORDER TODAY! 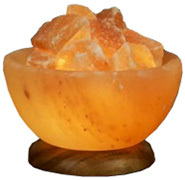 • Crystal Salt Bowl Lamp w/Salt Stones: Negative ion generator. Himalayan Rock Salt emits negative ions to clean the air and refresh the body. Complete with 110V light fixture, bulb and UL-listed switch. Hardwood base 6" diameter. 8" tall with stones. ORDER TODAY! • Crystal Salt Fire Bowl Lamp w/ 10 Glowing Stones: Negative ion generator. Himalayan Rock Salt emits negative ions to clean the air and refresh the body. Hand-carved Salt "coals" in 8" diameter Black Ceramic Bowl. Complete with Ul-approved 110v Light String with 10 Bulbs. 5" tall with stones. 5 lbs. ORDER TODAY! • Crystal Salt Aroma Lamp: Hand-Carved Salt Lamp provides the ideal combination of soothing light and fragrance. Hand-Blown Glass Diffuser. Complete with UL-approved 110V light fixture, bulb and switch. 5" tall. 3-4 lbs. ORDER TODAY! • Crystal Salt Mini Lamp w/Thin Black Base: Hand-Carved Himalayan Crystal Salt Mini Lamp provides the ideal combination of soothing light and fragrance. Complete with UL-approved 11OV light fixture, bulb and switch. 4-5 lbs. ORDER TODAY! Aloha Bay Glow Crystals are mined at the rim of the Sahara desert. This translucent selenite (literally, "stone of the moon") lights up perfectly, due to its slightly milky color. The base contains glowing lights in five colors (ultra bright LEDs four colors + white) that light up one after the other, to create the effect of gradually changing colors. You can freeze the gradual changing of the colors by pressing the "stop" button at any time to select the color of your liking. Powered by 3 AAA batteries or 110V adapter. • Selenite Pointed Prism Crystal Lamp: Includes black 5-LED base, AAA batteries and adapter. ORDER TODAY! • Halite Clear Diamond Crystal Lamp: This rare salt structure is almost perfectly transparent. Base with 5 bright LEDs in four colors + white to create the effect of gradually changing colors. For a single color, just press the stop button. 3 AAA batteries and 11OV adapter (included) ORDER TODAY! 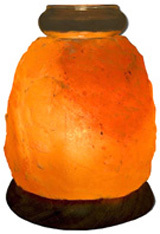 Aloha Bay Himalayan Salt Lamps come complete with 110V light fixture, toggle switch and special heat-resistant bulb. All electrical parts are UL approved. 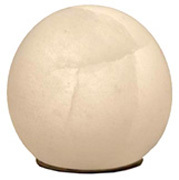 • White Salt Planet Lamp: Globe diameter: 6". Includes black base. Weighs 9 lbs. ORDER TODAY! • White Salt Lamp 8 inch: Includes Base 1/2 inch. Weighs 5-7 lbs. ORDER TODAY! • White Salt Lamp 4 inch USB: USB powered LED light. Weighs 1.2 lbs. measures 4 " tal.l ORDER TODAY! • White Salt Tea Light Holder 2.25 inch: 2¼" Tall. Weighs 0.9 lbs. ORDER TODAY! • Salt Lamp 4 inch USB: LED light USB powered with Hardwood Base, Weighs 1.2 lbs. Measures 4" tall. ORDER TODAY! 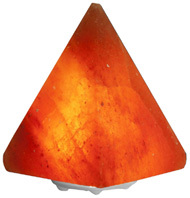 • Salt Crystal Pyramid Lamp: Himalayan Rock Salt emits negative ions to clean the air and refresh the body. Complete with 110V light fixture, bulb and UL-listed switch. 5" by 5" Hardwood base. Measures 6½" tall. ORDER TODAY! • Salt Crystal Pyramid 3.5 inch USB: LED light thin white base. Weighs 1.1 lbs. Measures 3½ inch tall. ORDER TODAY! CRYSTAL LAMP: White Salt Planet Lamp, 9 lbs. CRYSTAL LAMP: White Salt Lamp 8 inch, 5-7 lbs. • Glow Crystal Adapter: Optional 110V adapter for LED. Just plug into lamp and turn on. ORDER TODAY! • 5-LED Base: The black base contains glowing lights in five colors (ultra bright LEDs) that light up one after the other, to create the effect of gradually changing colors. Each time the base is turned ON, a different color sequence starts There are four color sequences (of 3 colors each) and one White sequence. With the other (STOP) Button you can "freeze color" with any sequence. Includes AAA batteries.. ORDER TODAY! • Replacement Bulb: For Salt and Stone Lamps. E12-11OV, 300 Degrees C, 15 W. Clear bulb. ORDER NOW! • Salt Lamp Replacement Bulbs Cord and 15W Bulb: 15 W. Clear bulb. ORDER NOW! Ancient Secrets® Himalayan Natural Rock Salt Lamps are hand carved salt products from the Himalaya Mountains of Pakistan. The warmth and natural beauty of the glow provided by these lamps makes them a wonderful accent for any room, as well as an outstanding and much appreciated gift for friends and loved ones. They will vary in the grain, texture, hue, opacity and richness of color. You can expect a warm orange-golden glow from the Ancient Secrets® Himalayan Rock Salt. BENEFITS: Helps emit negative ions, which help improve the feeling of a room, and enhance the natural sense of good feelings and enhance energy. They are considered especially beneficial to help cleanse and neutralize the atmosphere of the energy impacts of computers, microwave ovens, tv sets and other electronic devices which all emit positive ions and thus reduce your energy. USES: Home: Special usefulness in bedrooms, living rooms and home offices and kitchens. Helps create a peaceful, relaxing environment which offsets the negative effects of the electronic devices we use all the time. Office: Perfect accents to offset the harmful radiation and energies of computers and other office devices, and enhance their office décor. Natural Health Practices: Helps create a soothing environment for treating your clients or patients, or helps seek a healthy, natural and uplifting energy in your personal environment. As a gift: This is a gift that no one will ever forget! Everyone is attracted to them and people naturally feel uplifted and happier in the presence of an Ancient Secrets® Natural Himalayan Rock Salt Lamp. • Himalayan Rock Salt Lamp Large: Weight: 6-8 lbs. Includes switchable 6’ U.L. approved cord, convenient easy-change bulb assembly and bulb, with stainless steel convenience lamp plate on a beautiful wooden base. ORDER TODAY! • Himalayan Rock Salt Lamp Medium: Weight: 3-5 lbs. Includes switchable 6’ U.L. approved cord, convenient easy-change bulb assembly and bulb, with stainless steel convenience lamp plate on a beautiful wooden base. ORDER TODAY! • Himalayan Rock Salt Lamp Large with Feet: Weight: 8 - 9 lbs. 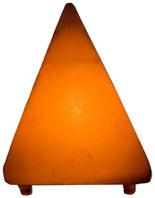 Salt Lamp includes switchable 6 U.L. approved Cord, with convenient easy-change Bulb Assembly and Bulb. ORDER TODAY! • Himalayan Rock Salt Lamp Medium with Slate Type Base: Weight: 8 - 9 lbs. Salt Lamp includes switchable 6 U.L. approved Cord, with convenient easy-change Bulb Assembly and Bulb. ORDER TODAY! • Himalayan Rock Salt Lamp Dew Drop: Weight: 8 - 9 lbs. Salt Lamp includes switchable 6 U.L. approved Cord, with convenient easy-change Bulb Assembly and Bulb. ORDER TODAY! 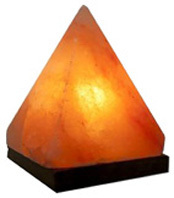 • Himalayan Rock Salt Lamp Pyramid: Weight: 7-9 lbs. Includes switchable 6’ U.L. approved cord, convenient easy-change bulb assembly and bulb, with stainless steel convenience lamp plate. Wooden base not included. ORDER TODAY! 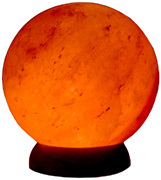 • Himalayan Rock Salt Lamp Sphere: Weight: 9-11 lbs. Includes switchable 6’ U.L. approved cord, convenient easy-change bulb assembly and bulb, with stainless steel convenience lamp plate. Wooden base not included. ORDER TODAY! Large with Feet 8-9 lb. | Dew Drop 8-9 lb. Ancient Secrets® Himalayan Natural Rock Salt Crystal Tea Light Holders are made from the same rock salt crystal that is used for our Salt Crystal Lamps. Simply light the enclosed tea light and it creates a warm glow without the use of electricity. When the tea light is finished, you can use any standard tea-light as a replacement. They will vary in the grain, texture, hue, opacity and richness of color. You can expect a warm orange-golden glow from the Ancient Secrets® Himalayan Natural Rock Salt Crystal Tea Light Holder. • Himalayan Rock Salt Crystal Tea Light Holder Medium 1 Hole: Weight: 3.5 lbs. ORDER TODAY! • Himalayan Rock Salt Crystal Tea Light Holder Small 1 Hole: Weight: 1-3 lbs. ORDER TODAY! • Himalayan Rock Salt Crystal Votive Holder: 3.5 inch. ORDER TODAY! Himalayan Rock Salt Tea Light Holder: Candle Holders provide cordiality and the natural beauty of the glow offers a delightful accent for any room, and as a wonderful gift for friends and loved ones. Helps cleanse and neutralize the atmosphere of the energy impacts of computers, microwave ovens, television sets and other electronic devices which all emit positive ions and thus reduce your energy. USES AND BENEFITS: HOME: They can be used anywhere in the home but find special usefulness in bedrooms, living rooms and home offices and kitchens. Use in these areas help create a peaceful, relaxing environment which offsets the negative effects of the electronic devices we use all the time. OFFICE: Perfect accents to offset the harmful radiation and energies of computers and other office devices, many people find these salt tea light holders just the right way to enhance their office decor. NATURAL HEALTH PRACTICES: Whether you are a practitioner trying to create a soothing environment for treating your clients or patients, or you are an individual seeking a healthy, natural and uplifting energy in your personal environment, these salt tea light holders are ideal for the negative ions they are said to emit when lit. GIFT: This is a gift that no one will ever forget! Everyone is attracted to them and people naturally feel uplifted and happier in the presence of an Ancient Secrets Natural Himalayan Rock Salt Tea Light Holder. • Tea Light Holder Lotus: 3.7 x 3.7 x 3.7 inches; 8 oz. ORDER NOW! • Tea Light Holder Heart: 3.7 x 3.7 x 3.7 inches; 8 oz. ORDER NOW! • Salt Tea Light Holder: Candle holder made of crystal salts. During usage, the salt crystal can become hot, or in cold rooms can attract moisture. For best results place your crystal on a heat-and waterproof surface. Warnings: A burning tea light is an open fire. Never leave a burning candle unattended. Includes 1 Palm Wax Tea Light. 1.5 lb. ORDER TODAY! • Salt Tea Light Holder 2¼ inch: Light tea light and experience the glow of the salt candleholder. Pure crystal-salt from the foothills of the Himalayas. The salt crystal can become hot, or in cold rooms can attract moisture. For best results place your crystal on a heat-and waterproof surface. Warning: A burning tea light is an open fire. Never leave a burning candle unattended. 2¼ inches. 14 oz. ORDER TODAY!